Regular readers know that candidate Donald Trump had difficulty with facts. He earned an astonishing 59 Four-Pinocchio ratings over the course of the campaign. Now that Trump is president, he continues to make misleading statements, based on incomplete information, inaccurate statistics or flights of fancy. Here’s an accounting of his public statements in the first seven days as president, not counting his error-plagued inauguration speech (which had eight problematic claims). If we wrote a full fact check, we noted the number of Pinocchios the statement received. This is debatable. At the very least, one might count the 1991 Persian Gulf War and the end of the Cold War as victories for the United States. On Dec. 9, when The Washington Post reported that intelligence officials had concluded that Russia had sought to undermine Hillary Clinton in the election, the Trump team issued a statement: “These are the same people that said Saddam Hussein had weapons of mass destruction.” After information leaked that Trump had been briefed that an unverified dossier alleged Russia had embarrassing information about him, Trump lashed out at the intelligence agencies and asked: “Are we living in Nazi Germany?” The media simply reported what Trump said about the intelligence community. Speaking to employees at the CIA, Trump complained about news coverage showing his inauguration crowd was smaller than Barack Obama’s crowd in 2009. Trump’s crowd did not go all the way to the Washington Monument. No matter how you calculate it, Trump’s crowd was significantly smaller than Obama’s crowd — and the Women’s March on Washington the next day. Trump has been on the cover of Time magazine a total of 11 times. Richard Nixon holds the record — 55. Depending on whether you count small photographs or not, Hillary Clinton has been on the cover between 22 and 31 times. Actually, Obama’s ratings in 2009 were 7 million people higher than Trump’s numbers. Second-term inaugurals tend to get lower ratings, so Trump is cherry-picking the comparison. This is clearly a made-up figure. As of the end of 2015, there were nearly 180,000 pages in the code of federal regulations. So, in theory, that means getting it down to 45,000 pages. There were 71,000 pages back in 1975. Even under Ronald Reagan, the number of pages climbed almost 20 percent. This is a fantasy, worthy of Four Pinocchios. Trump is obsessed with how he lost the popular vote by nearly 3 million votes, and so he keeps making this claim even though there is no evidence to support it. Trump lauded two executive actions regarding immigration and border security, including building a wall along the border of Mexico. Again, the numbers appear to have little basis in reality. Just building the wall is estimated to cost as much as $25 billion — before annual maintenance costs. The unions for ICE agents and Border Patrol officers did endorse Trump in 2016 campaign. But they did not do so unanimously. Hillary Clinton received 5 percent of the vote of the ICE membership, according to a statement by the National Immigration and Customs Enforcement Council. The National Border Patrol Council endorsement, meanwhile, was based just on the vote of 11 union leaders, which sparked controversy among union members. Agents in El Paso, in a 14-13 vote, narrowly failed to have the local union disavow the endorsement. Trump’s electoral college margin was relatively narrow by historical standards. He ranks 46th out 58 elections. A switch of about 40,000 votes in three states would have swung the election to Clinton. Not only is there no evidence of massive voter fraud, but there is no way Trump could possibly know this. No one was shot and killed in Chicago on Jan. 10, 2017, the day Obama gave his farewell speech, according to the Chicago Police Department. Trump, in the interview, said experts who said this would violate international law were “fools.” But there are practical problems, too. In 2015, Iraq produced about 4 million barrels a day, enough crude oil to fill more than 700 Trump Towers. Securing all of the oil, including in northern Iraq where the Islamic State exists, would require a military force larger than the one that invaded Iraq in 2003. Trump is lumping together the wars in Iraq (in the Middle East) and Afghanistan (in South Asia), which together cost about $1.6 trillion from 2001 to 2014. He is also adding in estimates of future spending, such as interest on the debt and veterans care for the next three decades. 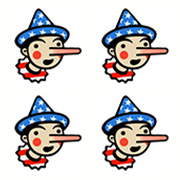 In attacking the Affordable Care Act, Trump repeats a Four-Pinocchio whopper. Some 20 million people have gained health coverage because of the law. About 2 million people were told their old plans no longer qualified under the law, but after an uproar, most received waivers that kept the plans going until the end of 2017. In any case, anyone whose plan was terminated could buy new insurance. Trump takes both comments out of context and twists their meaning. Dayton faulted Republicans for refusing to adjust the law, which he said made insurance “no longer affordable to increasing numbers of people.” Bill Clinton’s remark about a “crazy system” referred to the fact that people who did not qualify for insurance subsidies did not have a way to buy into Medicare or Medicaid. The trade-deficit number is close to correct, but Trump apparently does not understand the meaning of “trade deficit.” He often suggests this money could be used to pay for his planned wall along the southern border. But that’s nonsensical. A trade deficit only means that people in one country are buying more goods from another country than people in the second country are buying from the first country. No money passes from government to government. “Welfare” is a broad term and can apply to people who are working but receiving some government assistance. If someone is receiving means-tested assistance, it doesn’t necessarily mean they are not working. Not all people eligible for welfare collect benefits. When they do, many of the benefits are contingent on the recipients working or actively searching for jobs, as a result of an overhaul of welfare signed into law by Clinton in 1996. And even low-income families receive some level of public assistance. Trump is apparently unaware that participation has declined in means-tested programs such as Temporary Assistance for Needy Families (TANF) and the Supplemental Nutrition Assistance Program (SNAP, formerly known as food stamps). Caseloads in the TANF program have declined over the past 15 years, from about 2.4 million families to 1.6 million families. After its post-Great Recession peak in 2013, the number of people receiving food stamps has declined. In October 2016, there were 43.2 million people participating in the program, compared with 47.4 million in October 2013.